Does a $500 purse seem like a lot for you? Or have you spent that on a purse a few times over? 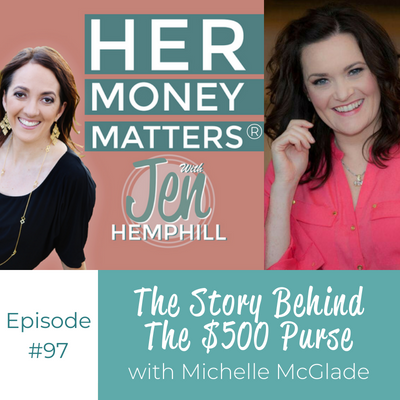 No matter where you stand there is a lesson to be learned in Michelle McGlade’s story so be sure to tune into this episode! Growing up, Michelle grew up around a scarcity mindset. Her parents were very young, really just kids themselves, and trying to get by. She grew up around comments such as “Do we have enough money?”, “Will there be enough money?”, and “That costs a lot of money.” And despite the fact that her parents grew in their careers and got to a point where things were much easier, the money story didn’t really change too much. Everything was budgeted. Michelle received an allowance for contributing and had a clear set of duties. However, she didn’t really learn about money except for observing her parents’ behaviors. A big takeaway for her though was having not gone to college themselves, her parents imparted the belief in her that if she went to school and got her degree, she would get a good job, and have stability and more than enough money. Admittedly, Michelle spends money really well! She was a saver for a very long time, and now she has more balance with her finances. She always took care of business, paying her bills on time and generally managing her money very well. Transitioning from corporate to entrepreneurship was a great learning experience for her, as she went from lacking the confidence to spend money on her business, and the fear that she wouldn’t make enough, to today where her money is a tool – an investment that helps her get to where she wants to go. She calls money her “business bus”. At home, she is the budgeter and the money handler, a role that came to her naturally. Typically, Michelle and her husband discuss their goals, in sort of a “state of the union” discussion, and processes are extremely simple. She uses an excel spreadsheet. She uses a card for all of her expenses and then pays it off at the end of the month, every month with all her other bills on automation. This is a system that works well for her, however, for some people, this would not work well as it requires discipline, and “money muscles”. Michelle really enjoys spending money on experiences. She shares one such event where she went to a new spa in her area, and spent the day enjoying their amenities. For her, this is where she likes to spend her extra money. She also outsources housecleaning services for the benefit of her relationship as both she and her husband dislike cleaning. From a business perspective, outsourcing the creation of a sales funnel was a great relief and some of the best money she has ever spent. In mid-career, when she took on a new role in her company, she negotiated a big increase in her salary which was a very proud moment for her. It was the first time she remember reaching past her expectations. She speaks of the importance of celebrating these accomplishments. In fact, after this huge win, she went out and purchased a $500 purse that she still has today and will never get rid of, and felt so! For Michelle, starting her first brick and mortar business in holistic health care clinic, and being able to pay all the bills, and having money left over – basically making something out of nothing is hands down her proudest money moment. Usually I give a shout out to a person in our community, today I wanted to do recognize those on my team that support me in getting this podcast out to you. A big thanks to John who does fantastic work on producing and editing the audio, Holly who has been doing amazing work on those show notes (if you haven’t noticed the show notes have definitely gotten an upgrade) and to Lyping who is always on top of our images. Creating and producing a podcast is not for the birds, it takes work, time and dedication and I couldn’t do it without them. It’s no secret we wear multiple hats and sometimes our headspace is completely full, it can’t take anymore. Yet we feel a need to get it done such as the cooking, the cleaning, etc. You heard Michelle talk about how she outsources her house cleaning and how that makes her life easier. There may be some other things you may want to outsource. If you ask me and what I would like to outsource next it would be the cooking. I love the idea of meal prepping for the week so it is an easy fix and you don’t have to resort to spending extra money on eating out. Here’s my personal challenge. In my current season of my life and how our schedules/activities/etc fall that would leave me Sunday to do the meal prepping. For me, that would take all afternoon, **sigh**. 2. Take the cost of what you want to outsource and plug it into your money plan, your budget and see what happens. I explain this fully in the podcast so be sure to listen to it!